We have 2 DSL teams, 2 GCL teams and only signed 26 players? More must be on the way! Well, we need to see who gets released/kept from last year's very large signing class. As yet, there's been no word about DSL (or GCL) releases, although you have to figure there will be a substantial number of cuts. No European players. It's always interesting to see a flyer taken on one of them to see if they go anywhere. I suspect the class will eventually include one or two. Most European players do not get large bonuses and also might not sign when they are 16 because they want to finish the equivalent of HS. There are a couple of Max Keplers that get big bucks at age 16. Just not too many. We probably will add 5-10 players from the other countries over the next few months (Europe, Colombia, Panama, Mexico, Australia/NZ). I suspect the class will eventually include one or two. Yeah. It's important to keep in mind that the list I posted is as of 10/31/18. That's one-third of the way through the signing period (which runs through next June 15th, as I recall). There could be twenty more names on that list by next June. Ergo, it's a bit early to do much of any "analysis" of the signing class! One correction to the list I posted earlier - Lizardo Herrera is Puerto Rican - and thus comes under the Rule 4 draft, not the international signing rules (so signed as a UDFA, not as an international FA). I've deleted him from the table (Kevin Escalante, signed the same day as Herrera, is also Puerto Rican). Philadelphia Phillies signed free agent OF Derek Escobar to a minor league contract. 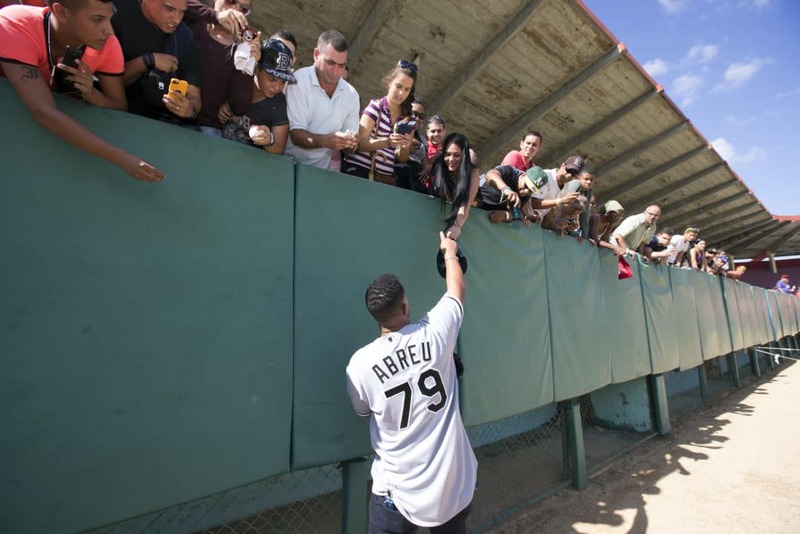 Escobar is a 16-year-old Cuban. Philadelphia Phillies signed free agent RHP Jose Guaramaco to a minor league contract. Venezuelan, will turn 18 next week. Well that's interesting. I guess so many have come over they don't all garner attention anymore. Timing is interesting too. Wonder if he took part in the showcase for the Mesa brothers and Gaston a few weeks ago. His name does not appear to be in any articles about potential prospects. Philadelphia Phillies signed free agent RHP Carlos Valero to a minor league contract. Valero's 19 (born April 1999), so presumably not a "major" signing. pretty nice 3 part article on the phils Latin views and operations. probably not much more than we have already known, but nice to see it brought out again. Hopefully, sal is following more than a few 15 years olds, at this time, to get the pen and ink ready. Added a few more signings, from recent additions at the phillie.com transactions pages, to the list above. The list is here. Signed Raulyn Blanc a 17 year old SS from the D.R. last Friday. Yep. Added him to the list above a couple of hours ago. Maybe they had some of these lined up, but had to trade for money. Some info on the new Cuban international agreement here. It is a posting system with some similarities to Japan and Korea. 15%-20% of major league guaranteed contracts and 25% of minor league deals would go to some sort of Cuban baseball federation or fund. Certain Senators (i.e. Rubio) are opposed because it is a workaround to sending money to the Cuban government in some way. What is confusing to me is that the higher fees on minor league deals appear to be a way to provide incentive for Cuban players to stay in Cuba until they are 25 and they would get much more MLB money. Is that really going to work on a 16-year-old though - telling them to wait 9 years when they might make much more money? A new agreement comes as a massive relief to Cuban MLB players past and present, and could dramatically change opportunities for the next generation.